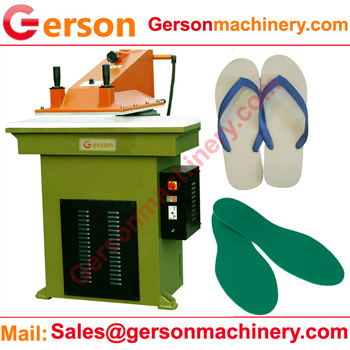 Rubber Foam Slipper Insole Die Cutting Machine is one of shoes making machinery to make shoes slipper sole.It is great die cutting press machine for making rubber slipper sole or rubber foam slipper chappal . if you want to see the details or video ,you could visit and contact us . 2.The manual model require double hand operation ,which can make sure the safety for the oeprator or worker.It is manual feed ,but hydraulid driven pressure cutting ,we also have the human power type which is very small type die cutting machine ,you could contact us for the details. 4.Gerson can make any custom die cutting machine not only for making the rubber sole ,also can make any similar products .All about our machine or need any help ,please contact us.